out of the blue, an exhibition featuring artwork inspired by weather, geological and atmospheric conditions, will open at Bergen Community College's Gallery Bergen on Tuesday, February 17, 2009 at 6 p.m. An opening reception will be held from 6-8pm. Curated by Amy Lipton and artists Joy Episalla, and Joy Garnett, out of the blue presents works by 24 prominent artists from New York City, Philadelphia, Los Angeles, London, Toronto and Vancouver. The exhibition focuses on the dynamics of human creativity as a metaphor for geological and atmospheric phenomena. Treating issues of weather both literally and symbolically, out of the blue approaches the creative process as a kind of weather system. Ideas, like hurricanes, seem to come "out of the blue," though they arrive through a combination of complex forces. Through metaphors provided by art, out of the blue leads us through the tangle of influences—both innovative and destructive—that humans exert upon one another and the environment. Understanding and cultivating these influences and relationships is the key to our cultural vitality in a world where technological hubris and political arrogance can overshadow tolerance and collaboration. 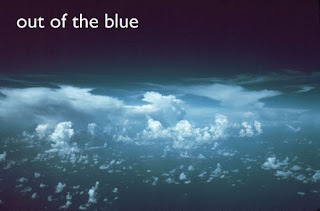 out of the blue generates its own weather conditions, a storm of intertwined processes - artistic, social, political, atmospheric, and geological. As we influence one another, we in turn affect our culture and the environment, and creativity itself becomes a force of nature.